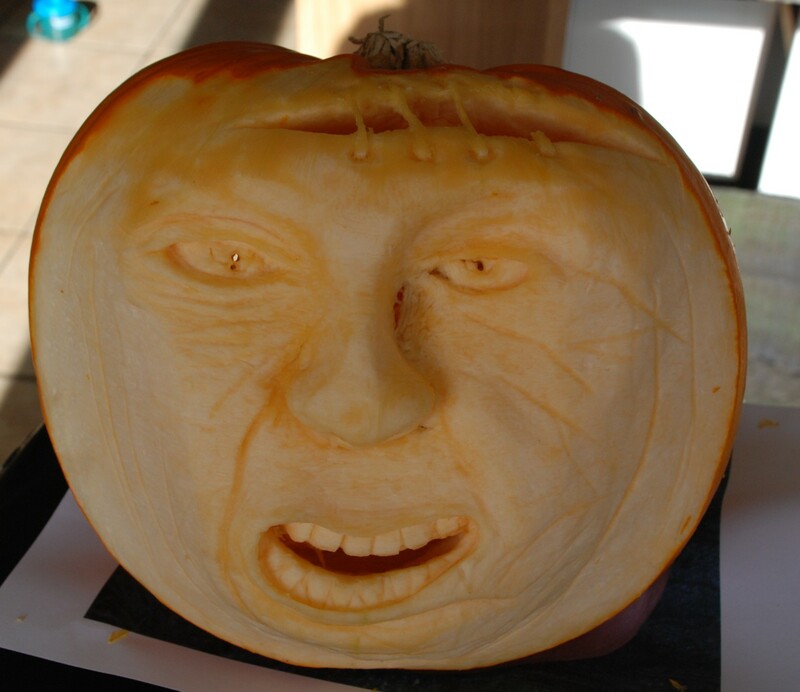 Last night, I sat down with a big drink, a pumpkin, a picture of a scary pumpkin face, and a sharp knife. Hubby came and sneered at my picture, as Hubbies unfortunately sometimes do, implying that my attempts would fall well short of the awesome pumpkin-scary I was using as inspiration. I offered to chuck the photo and use him instead, but he demurred. Irritated with his incessant one-upmanship (Yes, it’s all tongue in cheek… but only just. The man is a twin, and pathologically competitive.) I have invited him to do better. He has accepted. His Halloween lantern will be ‘traditional’, apparently, and look ‘like they are supposed to’. It looks proper cacky-drawers when it’s lit up, but I will need to rootle out a camera tripod to take proper glowing night-time shots. Hubby’s will appear here later in the week and they will be submitted to your votes, courtesy of the annoying PollDaddy facility that has recently popped onto my menu bar. Voting is strictly anonymous, so you needn’t worry about individually hurting his feelings.